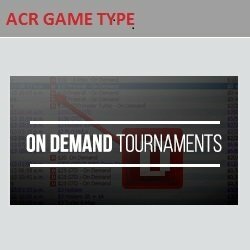 On Demand tourneys at ACR begin once a stated number of entrants have joined, just like in a sit-n-go. Unlike a sit-n-go, however, more people can enter during the late registration period as is the case in most multi-table tournaments. This format of poker thus gives you the flexibility of a SNG combined with the potential for the large prizes common in MTTs. There are NLHE On Demand events listed in the lobby at Americas Cardroom from $0.50 + $0.05 through $20 + $2. For PLO/8, there are two entries present: $7 + $0.70 and $15 + $1.50. These tournaments fire when between 6 and 18 participants join. They’re treated like sit-and-gos for the purposes of the Sit & Crush leaderboard, so you’ll accumulate points like normal. There’s also a $10 Freeroll On Demand that starts whenever 270 people register. ACR maintains a leaderboard for these freerolls, and at the end of each week, the top placers receive complimentary tournament tickets. To partake in On Demand tournaments, you must first have an Americas Cardroom account. Read our Americas Cardroom bonus code page to find out how to get started. Poker tournaments On Demand? Only when you join ACR!